When you approach her, she will get right to the point: "This is the Bay Roan Stables. Are you interested in a horse?" If you ask her about her city of choice, she will start to advertise her own business: "You MUST have a fast horse! Travel quickly to ruined forts and caves nearby! It will pay for itself with precious time saved!" 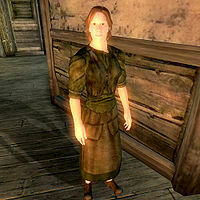 On the subject of horses, you will get the full sales speech: "We have some of the best bay horses in Cyrodiil. They are hardier than the Chestnut and faster than the Paint horses." Should you change your mind and decline her offer, she will say: "How unfortunate. Don’t be a stranger. We have a fine selection of Bay horses if you change your mind." Should you choose to accept her offer, she will point you towards Antoine with the words: "Excellent! Go out to the corral. Antoine will have your new Bay saddled and ready for you." Antoine will point you toward Isabeau should you approach him: "If you are looking to buy a horse, go inside and talk to Isabeau."